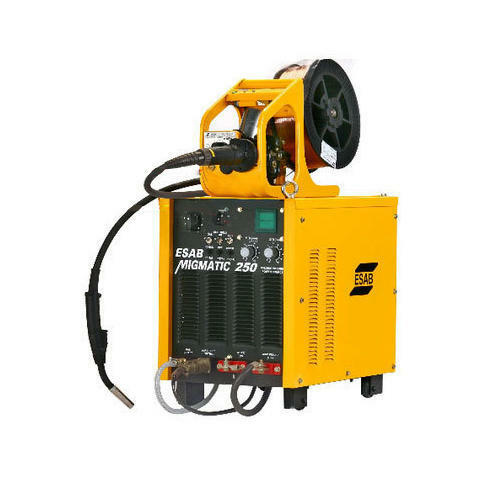 In order to cater to the numerous necessities of the patrons, we have been able to provide a qualitative range of Migmatic 250 MIG Welding Machine. Operation Migmatic 250 allows high speed welding without compromising quality on thin sheets having the wire feeder as a separable unit. Established as a Sole Proprietorship firm in the year 2006 at Ludhiana (Punjab, India), we “Shiv Durga Enterprises” are an Authorized Dealer of ESAB INDIA LIMITED a wide range of Welding Electrodes,Brass brazing wires, MMA Welding Machine, Welding Accessory, MIG Welding Machine, Repair & Maintenace welding jobs for Forging, Sugar mills, Thermal Power plants etc. We procure these products from the most trusted and renowned vendors after stringent market analysis. Further, we offer these products & Services for Repair welding at reasonable rates and deliver these within the promised time-frame. Under the headship of Experienced person “Mr. B.P. Sharma” (Proprietor), we have gained a huge clientele across the nation.Moreover we are tursted Esab authorized Dealer in Ludhiana.